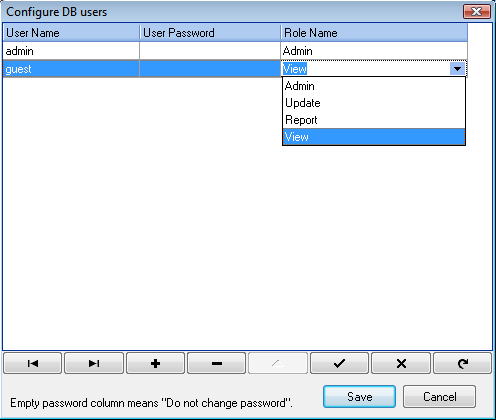 This command is only available for certain types of databases, which supports different user's accounts. There is only FireBird database with these capabilities in initial release of EurekaLog Viewer from EurekaLog 7. This command is disabled for view mode. In-memory and file-based databases do not support user's accounts. This command also can be disabled, if you have insufficient rights on target database (you can change current database in settings). See also: defaults. You can use "+" or "-" buttons to add or delete user's account. If you create a new account - then you must specify a password. If you leave "User Password" column's value empty - the account will have no password. 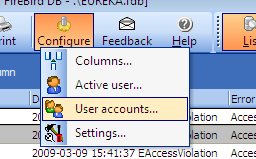 If you edit an existing account - then you must leave "User Password" column's value empty if you do not want to change password. Or you can enter new password. Note, that you can't reset password to empty one. See Database roles to more information.